Are you a fan of Dinosaurs? “Yes, obviously. They’re fantastic.” Are you also a fan of Pirates? “Well, naturally, who isn’t?” And is your attention-span not quite up to watching a Pirates of the Caribbean/Jurassic Park double-bill? 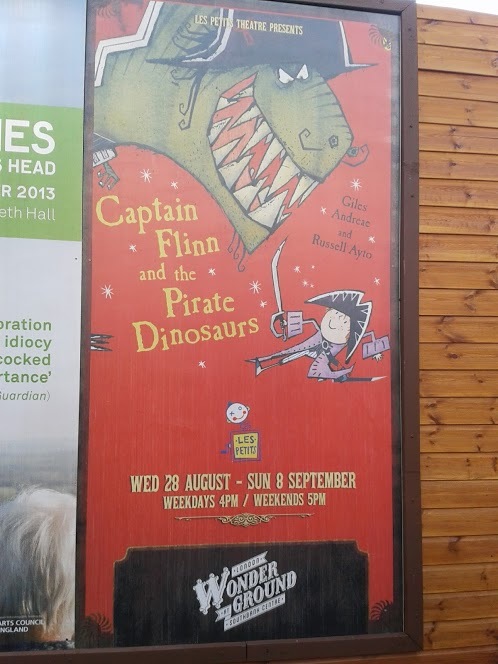 “Well that does sound great, but my pre-schooler might struggle with a four-and-a-half hour Pirate/Dinosaur fest. Couldn’t you suggest something more around the 50 minute mark?” Well fear not! 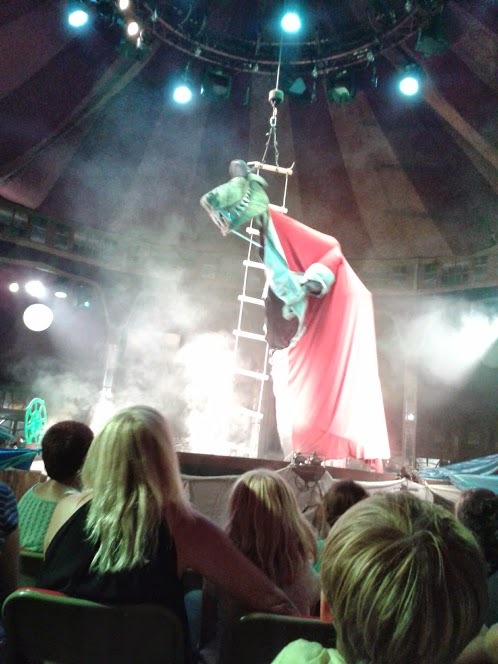 London’s Southbank is currently home to Wonder Ground, which in turn is hosting Les Petits Theatre‘s adaptation of the literary classic Captain Flinn and the Pirate Dinosaurs. While Mrs LWAT the Blogger and Miss LWAT the Blogger’s Daughter were busy killing time, Master LWAT the Blogger’s Son & I took in the show. There were four cast members whose names are, after a brief yet unsuccessful internet search, unknown. There was the guy who looked a bit like Chris Martin from Coldplay – he played Captain Flinn/Pirate Stegosaurus/various sea creatures, there was the lady – she played Pirate Pearl/Pirate Triceratops/various sea creatures, there was the tall guy – he played Pirate Tom/Pirate Pterodactyl/various sea creatures, and there was the guy with the mad hair and a selection of accents – he played Miss Pie/Captain Stubble/Pirate Diplodocus/Pirate Tyrannosaurs Rex/various sea creatures. Anyone familiar with Giles Andreae and Russell Ayto’s books may have noticed the Stalin-esque purge of Pirate Violet from the story. Get over it. Other than that, the performance follows the book pretty closely… with added musical numbers accompanied by Pirate Tom on the ukulele. Despite the doubling up of characters amongst cast members, the play ran very smoothly without any breaks for costume changes – there was pretty much at least one of them on stage at any time keeping the action going. Captain Flinn gee’d up the audience to be his pirate crew (which involved covering up one eye, making one finger into a hook shape and shouting ‘Arrr!’ now and then), however Roo was quite firmly supporting the Dinosaurs team. There were some moments that might be a bit scary for little children (indeed the toddler boy that was to our right in the audience cried as Captain Stubble put a sheet over his head and pretended to be a sea monster) and the Tyrannosaurus Rex was indeed a fearsome sight to behold as he towered over Captain Flinn. VERDICT: A great adaptation of a wonderful book – such an imaginative story of fantasy adventure was crying out to be brought to life within the theatre. The show is only running until 8th September – so no dilly-dallying about if you want to see it. 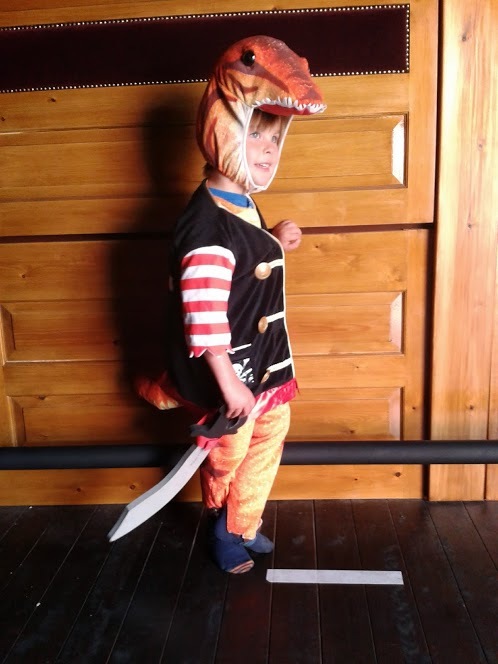 This entry was posted in Creating precious childhood memories or something (days out) and tagged dinosaurs, pirate dinosaurs, pirates, southbank centre, theatre. Bookmark the permalink. Braving it this weekend, think we’ll be cuddling Weasel when the trex comes out, he’s enormous!